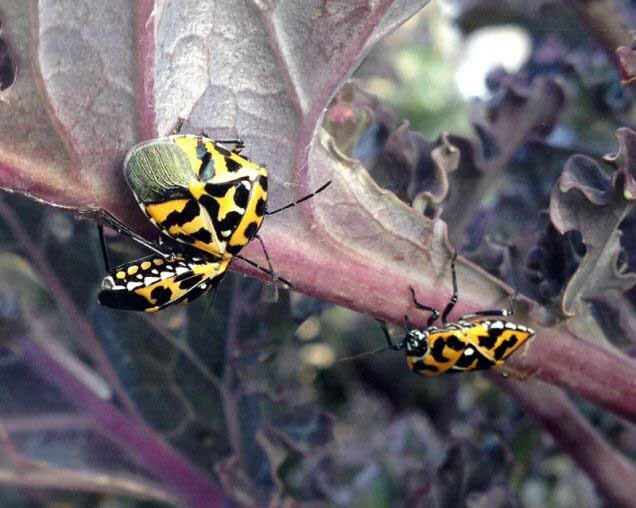 The Harlequin Bug, also known as the Harlequin Cabbage Bug, Calico bug or black stink bug can invade your garden when conditions are right. They are particularly bad pests of cabbage, broccoli, kale, radishes and cleome. Most often, once it begins to get warm and these plants start showing stress, stink bugs will move in to devour the plants. They damage plants by sucking the liquids from them. Stink bug infestations can com on fast and populations can explode in your landscape. They can also be difficult to eradiate. These stink bugs can have 5 or 6 new generations per year when conditions are right. While they are brightly colored, they are not toxic to pets or birds. Have backyard chickens? These make a great treat!